Instagram has begun rolling out its advertising platform to Australian users 12 months after the social media site launched its inaugural offering in the US. The company announced a host of iconic Australian and global brands as the first takers for local Instagram ads including Tourism Queensland, Flight Centre, Ben & Jerry’s, Toyota, McDonalds, Lenovo, Audi, and Mondelez International brands, Vegemite and Philadelphia Cream Cheese. As previously reported, Instagram will roll out ads slowly across the platform, a move it says allows it to spend more time ensuring ads suitably the look and feel of the social site. The ads incorporate both photo and video-based content and are marked with a sponsor’s label. Instagram also began rolling out ads in the UK last month, attracting a range of brands including Starbucks, Cadbury, Channel 4, Rimmel London and Waitrose. Users can choose to hide ads and provide feedback on the ads. In a statement, director of digital marketing and Tourism and Events Queensland, Chris Chambers, said the Instagram platform was an opportunity to expand its reach, build advocacy, and influence travel decisions made by the millions of consumers using the social network. “Instagram is the perfect platform to showcase Queensland’s holiday credentials, allowing fans to share authentic images in real time,” he said. Mondelez president of cheese and grocery for Asia-Pacific, Darren O’Brien, said working with Instagram was part of the company’s efforts to diversify and modernise its media buying activities. “There’s no denying that social is part of the media ecosystem and if that’s where our loyalists are consuming content, brand participation is a natural extension of this,” he said. Audi Australia general manager of marketing, Kevin Goult, said Instagram was complementary to its core brand pillars of innovation and progressive design and had already proven a successful channel. 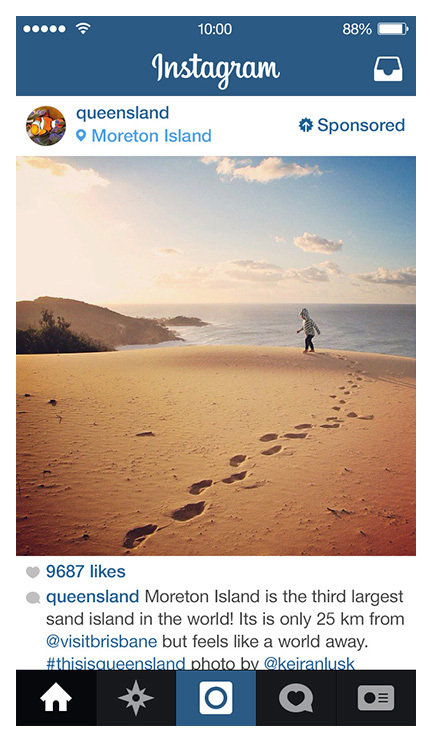 Instagram is already claiming strong results for brands advertising on the platform. Three months after its US launch, the company released details on the effectiveness of the first four brand campaigns on its site undertaken by Ben & Jerry’s and Levi’s. The company report a 10-point incremental life in brand message awareness per campaign for all four activities based on people who were repeatedly exposed to the campaigns versus control groups, and a 32-point lift in ad recall. In total, it claimed Levi’s reached 7.4 million people in the US across a nine-day period in its target 18-34 years age group, while Ben & Jerry’s reached 9.8 million people over eight days in its 18-35 years target demographic.